Do you love the Tankwa art scene and want to get involved? You can! 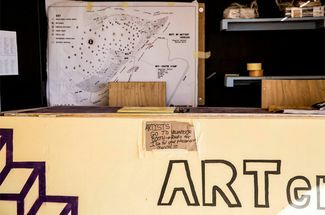 Arteria Booth supports the artists arriving in Tankwa Town with registered and unregistered artworks, including overseeing art placement on the Binnekring, and depends on Volunteers to be successful. Volunteers assist with burn schedules, safety of artworks, clean ups and all manner of other arty queries that might arise. It’s easy, fun, and gratifying, and you will be well briefed on how and what to do. The Arteria booth will open several days before the event starts when many art works are being erected. Arteria stays open after the event is finished to support teams cleaning up their burn sites and/or dismantling their artworks if they weren't burnt. If you'd like to work with Arteria, year round, please read about all the different ways you can support the artists in their creative endeavors, at the ARTeria.